I can’t believe I didn’t notice, first time round, that Phryne manages to move into house number 221… and then adds a B. I love the little references to other detectives — like the Megatherium Trust, for example (a reference to Sayers). Phryne, I love your wit. Or is that Greenwood? Anyway. Flying Too High is another fun instalment, which I enjoyed rereading. 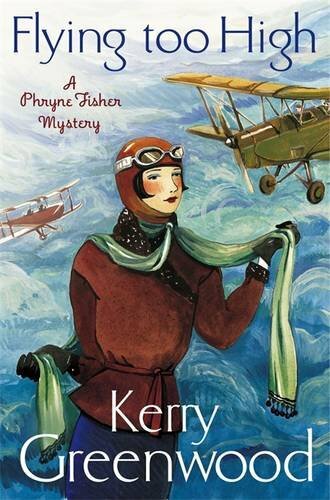 I love that Phryne can fly a plane and that it’s a part of several later stories, and I love the women that come into her story being awesome in their own ways. Dr MacMillan, in the first book, and in this book, Bunji Ross. One’s a female doctor, the other’s one of the most daring fliers in the area. Just gotta love it. Not all of Phryne’s found family has joined her yet, by this book, and so it’s missing a few of the domestic comforts I love. But it does have Mr and Mrs Butler, who are just perfect. And I adore the loving way Phryne’s clothes and food are all described. She’s so unashamedly feminine, and so unashamed of enjoying the good things in life.